Does Westbrook want what Durant turned down? There are thirty teams in the National Basketball Association and fewer than ten superstar players that can be called the absolute face of a team. You have Stephen, Lebron, Carmelo, Dirk, and Anthony (in Orleans). Even the former face of the Heat in Miami, Dwyane Wade, cannot claim that moniker in Chi-Town. Sure there are others, but when you get to the quick of it, right now, take the top five players in the world, James, Curry, Anthony Davis, Russell Westbrook and Kevin Durant, only four can say definitively they are the face of the team they play on. The now moved Kevin Durant, the second or third best player on earth cannot say he is the top dog in Golden State. That honor goes to Stephen. Sorry Mr. Kevin, but you have put yourself in that dreaded number two position that you despise. This one in is on you bud….have a Budweiser you West Coast pirate. Sure, I now included Russell Westbrook as the face of the Oklahoma City Thunder. Some, probably most, did not consider the best athletic guard in the history of the Association as the face/leader of the team on Reno Street. That belonged to the now much hated (in OKC) Kevin Durant. But today, an early day in July 2016, he is, and if he would play the part, could become what Kevin Durant was and more. The former scoring leader in the Association could be the one with the statue in front of the Peak in a few years. He could be the Kobe of the Thunder, with no competitors for the honor in my lifetime. Is Russell the man that wants that, or is he of the kind that wants something else? Speculation is we don’t know at this time. But as Adrian Wojnarowksi, NBA best insider reports, Westbrook isn’t a lock to leave. Only time will tell if Westbrook plays in Oklahoma City in the 2016-17 season. Will General Manager trade him away this summer, or before the trade deadline in February 2017? Does Russell want to come back to the Thunder in the summer of 2017 if he is still with the team? I have faith Sam Presti make the correct decisions. It is not his place to be the one to decide what Westbrook does. That must be left up to Westbrook. Have faith in Presti, as he can do only what he is suppose to do, which is to sell the organization to players along with putting the Thunder in the best position to be a viable team season to season. With Westbrook, Presti is dealing with a player that is not playing a game of saying one thing and doing another. That is good for Presti to know in the next months. It gives the GM of the Thunder a fair shake in doing his job. We can thank Russell Westbrook for that. There will not be any questions on where he stands, and most importantly, a deception of heart is not in play here. Yes, Westbrook can change his mind, but he won’t play the GM as the former face of the team did. To be a man, honesty is paramount. Westbrook is a man. 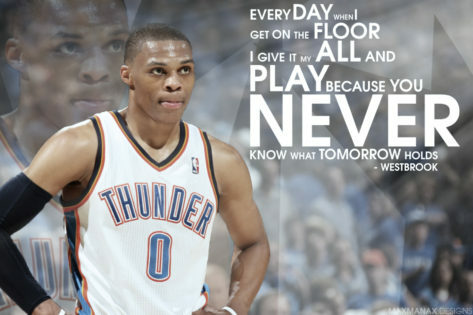 I would love for Westbrook to be the new face of the Thunder. He was carrying the team last season anyway. I believe we have a great team without Durant. I’m looking forward to next season. Thunder Up !!! 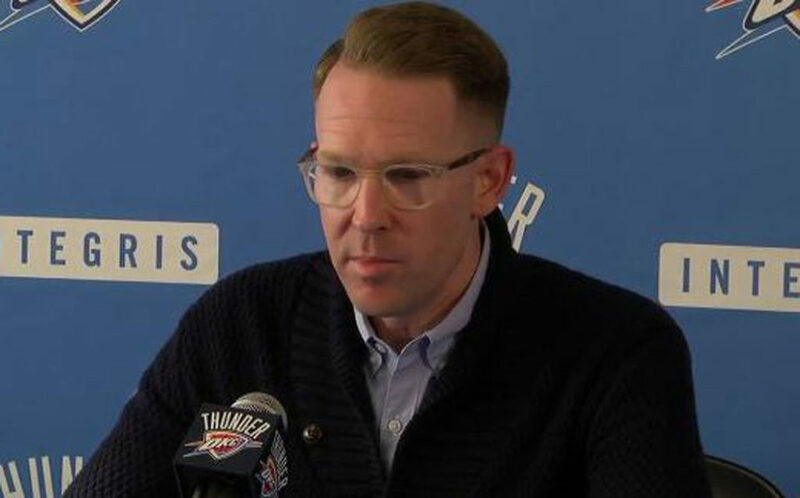 hopefully Presti can do the job and get him to be all in here in OKC….